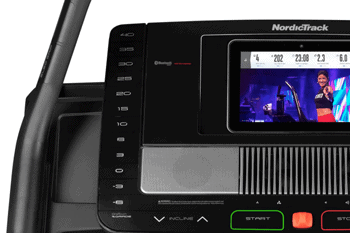 The NordicTrack Commercial x11i Incline Trainer is ON SALE! Price Alert: This is $500 OFF the regular web price of $2499. Don’t miss this great savings! NordicTrack’s focus with the Commercial x11i Incline Trainer was to create a machine that would burn serious calories and they succeeded. The machine’s unique design is combined with leading edge interactive technology that will motivate you to reach your fitness goals. Our team had the opportunity to review the x11i Incline Trainer when on a visit to the Icon Fitness corporate headquarters in Logan, Utah. This machine definitely made our tester break into a major sweat! The NordicTrack Incline Trainers are primarily walking machines due to their steep incline, although the 60″ treadbelt will accommodate runners. This machine is a favorite with hikers because it allows them to simulate walking up hills and mountains. The ability to get an intense cardio workout while just walking makes these machines especially popular. You can burn calories like a runner, but without the stress and strain to your joints. 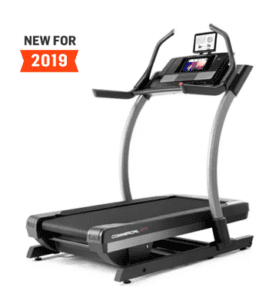 MID-WEEK SALE ENDS THURSDAY: The NordicTrack Commercial x11i Incline Trainer is reduced to $1,999 with FREE Shipping. Financing is available. 4.25 Continuous Duty HP Motor – This is a monster of a motor. It matches what you’d find on a commercial grade treadmill. Unless you are excessively overweight, this motor will run effortlessly at the highest inclines. Next-Gen Sled Push – This is a newer feature from NordicTrack that allows you to perform a full body blasting sled push workout on your machine. If you haven’t seen or done this type of exercise before, it is exactly what it sounds like. You are working your entire body by pushing a weighted sled a set distance along the ground. By placing your hands on either the sled grips or the push bar on the Commercial x11i, you align your body to do a sled push workout. From there you simply set your speed to 1mph and start pushing! 22″ x 60″ Treadbelt – In addition to a lengthy 60″ belt, you also get an extra wide 22″ width, giving you an extra comfort zone when you walk or run. Ability to Incline and Decline – The Commercial x11i inclines to 40 degrees and declines to -6 degrees, giving you the sensation of hiking up and down mountains. In the process, you are able to target numerous lower body muscles. 10″ Interactive HD Touchscreen -These interactive screens give you vibrant feedback on your exercise stats and let you view your iFit Live programming in beautiful clarity. Create custom workout routines focused on specific fitness goals and choose from 16,000+ On-Demand Workouts. These workouts cover several weeks, are progressive, and include audio coaching. Your stats are uploaded to your iFit account where you can track your progress. Use Live Interactive Training – Your trainer will control your speed and incline so you can get top-knotch results. New daily workouts available. Trace routes on Google Maps. 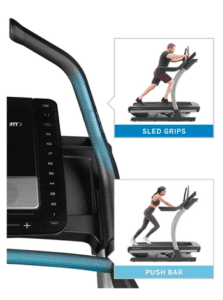 The NordicTrack x11i will simulate the terrain with the incline and decline feature. Then, watch your progress on Google Maps with the Android Browser. Access videos of famous landscapes and city-scapes. You can walk famous trails and once again your x11i will simulate the terrain. The video syncs with the speed of the machine. Note: This model comes with 1-year FREE iFit Membership. After that, there is an additional charge for this feature. Learn more here. 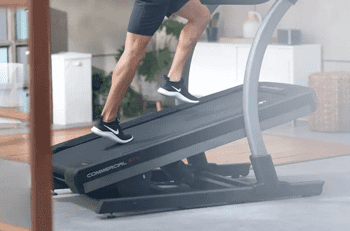 44 Installed Workouts – There are a wide selection of pre-installed workout routines that control the speed and incline of the X11i Incline Trainer. Program examples include calorie burn, interval training, speed training, and intensity goals. Warranty – The X11i has one of the best warranties in the industry. This coverage speaks volumes on the durability of this machine. Snap Assembly – We have not assembled this machine, but NordicTrack states, “Get your machine from out-of-the-box to ready-to-workout sooner. 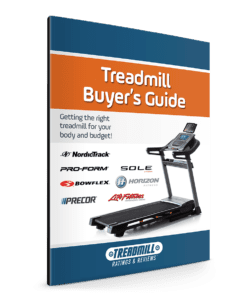 Simple process takes less than half the assembly time of regular treadmills.” Having assembled our share of treadmills, cutting the time in half is a plus. Stable and Solid – We are not sure what the weight of this machine is, but we couldn’t budge it during testing. We would highly recommend you get at least the inside delivery and not the standard delivery to the curb, which is standard with all fitness equipment companies. Other Features – Speakers, MP3 input, fan, table holder, grip heart rate monitor, wireless heart rate monitor and large 2.5″ rollers. We were thoroughly impressed when we tested the Commercial x11i. It is a heavy duty fitness machine that is built to take a beating. The recently added Next Gen Sled Push just adds to the experience. In addition, it comes with interactive features that are designed to motivate and keep you on track towards your fitness goals. Probably the best endorsement is the fact that this is the machine of choice for Icon Fitness employees. They can choose from numerous treadmills and elliptical trainer, and their choice is an Incline Trainer. End of story. I’m a little over six weeks into ownership, and I love this machine. It is heads and shoulders above the TRUE treadmill it replaced. Ordering was easy, delivery was within a week, and the white glove service worked great. The workouts are tremendous, whether you want to do cardio or burn fat or both. I’ve had to call support once, and the connection was fast (no being on hold forever), I spoke with a human, and the fix is being shipped as I type. Can’t say enough good things about the experience, and for a 60-something year old, that’s not bad. Is the IFIT subscription required and how long is it required to obtain a subscription? iFit Coach has been optional with NordicTrack up until around September of 2017. That that time, NordicTrack made it a “required” add on at the time of purchase and a one year subscription. That is still the case….however, a few days ago they started a promotion for the X11i Incline trainer and are including iFIT coach one year subscription for free. You will want to take advantage today as it will be removed anytime and no longer available.